The story of how polarization will help unveil the geometry of binary neutron star mergers. When the discovery of the first gravitational-wave source (GW 170817) and of its electromagnetic counterpart (AT 2017gfo) was announced on Oct 16, 2017, I was extremely excited and grateful to be witnessing and contributing to such historical moment. This one single event marked year zero of the multi-messenger gravitational-wave era and was the subject of some 500 articles posted on the arXiv in the past year. It was generated by the merger of two neutron stars and gave rise to an electromagnetic transient - dubbed “kilonova” – that was followed with all the main ground-based and space-borne facilities. Despite the general agreement between existing models and data, we are still missing some crucial ingredients to complete the picture. State-of-the-art simulations and the analysis of AT 2017gfo suggest that the material ejected in kilonovae is very likely to be distributed in two distinct components: a "red-component'' around the merger plane characterised by the presence of heavy elements (including the so-called lanthanides) and a "blue-component'' at higher latitudes characterised by relatively lighter elements. However, critical parameters of the system like inclination and mass, velocity, composition and distribution of the two ejecta components are still uncertain. That's where polarimetry comes to rescue! Polarization is sometimes seen as a nasty and pretty unsettling quantity to think about as, unlike the other two and more familiar properties of light brightness and colour, it is almost impossible to observe with the naked eye. However, we deal with polarized light every time we stare at a beautiful blue sky, we use polaroid sunglasses or watch 3-D movies, just to list a few. In astronomy, polarimetry is an extremely powerful technique to study the geometry of extragalactic sources - like our kilonova AT 2017gfo - that are otherwise too far away to be resolved even with the largest telescopes. In our work, we predict for the first time the polarization signal expected from a kilonova and identify the best strategy to constraint important parameters of the system via future polarimetric observations. Predictions were made using a radiative transfer code that I put together four years ago during my PhD - back then, I'd never imagined that a code tailored to study supernovae would some day turn useful to investigate other mysterious sources as kilonovae! Our work demonstrates that the presence of two separate ejecta components gives rise to a polarization signal in kilonovae. This is illustrated in the cartoon below: while photons coming from the "red-component" are typically depolarized by interactions with atoms, photons from the "blue-component" are preferentially scattered off and polarized by electrons. A cartoon illustrating the origin of polarization in kilonovae. Photons escaping the ejected material from the "red-component" are preferentially depolarized by line interactions, while those leaving the ejecta from the "blue-component" are more likely polarized by electron scattering. The figure below shows that the polarization signal can reach 1% levels for favourable orientations of the system. Not only, the viewing angle dependence of the signal allows us to constrain the inclination of AT 2017gfo to within 60 degrees from the polar direction (cosine of the angle smaller than 0.4) based on the upper limit on polarization for this event (smaller than 0.2%). But there is more! 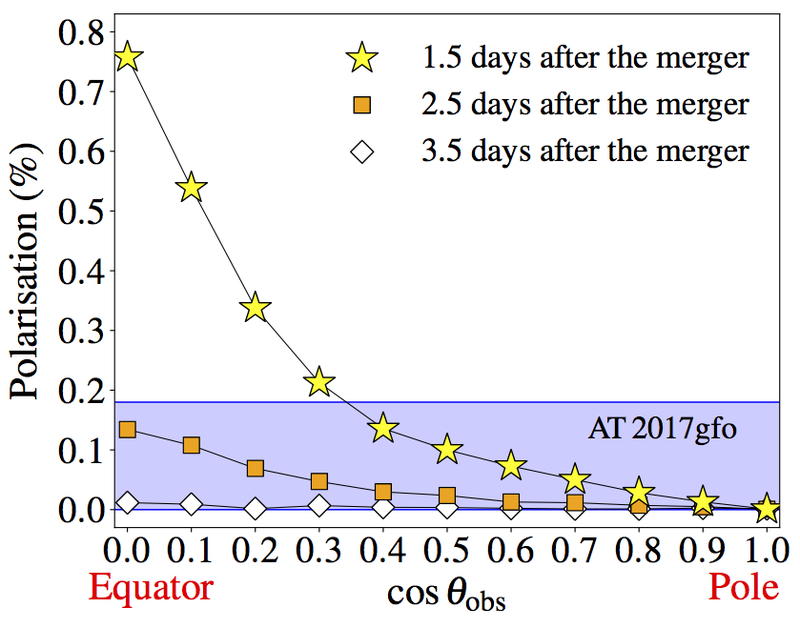 Our simulations indicate that the polarization signal in kilonovae peaks around 7000 Ångström and becomes negligible starting from about 2-3 days after the merger. These predictions are really critical to plan future polarimetric campaigns, identifying early-time observations around 7000 Ångström as the best observational strategy to detect polarization in kilonovae. They also suggest that any observed signal after 3 days would not be intrinsic but rather due to intervening interstellar dust, which can then be characterised using late-time polarimetry and disentangled from the intrinsic signal at earlier epochs. Polarization predicted by our simulations as a function of the observer orientation (from equator to pole). Different symbols correspond to different epochs from the binary neutron star merger. The blue shaded area marks the range of polarization estimated for AT 2017gfo. And the best is yet to come! LIGO and VIRGO will restart taking data in a few months and will discover many more kilonovae that could be followed-up with polarimetry. The detection of polarization in future kilonova events, coupled to the predictions made in our study, will unambiguously reveal the presence of a lanthanide-free "blue-component" and allow us to constraint important parameters like the geometry of the ejecta components and the inclination of the system. A planet around Barnard’s Star… finally?